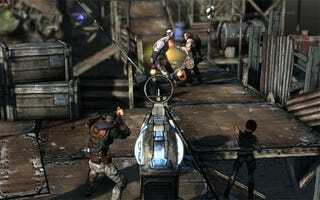 Gearbox Software's shooter-RPG hybrid is an addictive blend of loot hunting and cooperative play. Now that the game is in the hands of a larger audience, we wanted to see how well the game holds up in the real world. When we played Borderlands for our review, the number of people playing numbered in the dozens, maybe the hundreds. Good enough to get a taste, but not indicative of real world performance. That's why we do the Online Status Check. Our thoughts and the thoughts of others, after this. Finding Games: Fairly easy today, considering the Kotaku readership was nice enough to flood my Xbox Live Account with friend requests. Even before that explosion of Live friends, finding a Quick Match didn't take too long, about 30 seconds to find a game, then another 15 or so to join. Sending requests and inviting friends via the pause menu is straightforward and generally reliable. What wasn't reliable, however, is getting an invite before having loaded my character. I could accept game invites that would do nothing. There were a few instances of trying to join games, this time after loading my save, to no avail. The game would save, indicating that I was about to join a co-op game, then... nothing. My single-player game would continue as normal. Matchmaking: Joining up with other Borderlands players at your level isn't as big of a concern, but when I did join a Quick Match, I was usually within 10 levels of my partners. Since Borderlands' draw isn't multiplayer versus, joining games with lower or high level players isn't as much of a negative, but it definitely helps. Reaction Time: Playing Borderlands via Xbox Live was certainly playable, but I did experience some lag during my play time. It wasn't bad, especially considering the more laid back speed of the game, but lag did have an impact on timing jumps in the game. Bothersome, when trying to jump up to a treasure that rests on top of a building. General Consensus: The folks that I played with didn't have many bad things to say about the multiplayer experience, but I know I wasn't the only one have a few game invite issues today. The Gearbox Software tech support forums for Borderlands aren't lacking in technical issues surrounding the game, many of them related to the online experience. The PlayStation 3 friends list issues that cropped up at launch may not have been resolved for everyone, according to the forums. Some folks appear to be having custom game matchmaking issues at higher levels and on second playthroughs. Regrettably, the number of issues affecting the PS3 experience appear to be higher. PC owners can't weigh in on the experience yet. The game won't be available for them to play until the Windows version officially releases on October 26. You can experience the rage at 2K Games' forums. Overall Personal Experience: Outside of a few failed connections to invites, the experience has been good. Not great, considering a bit of lag and an inability to play with Owen Good earlier today, but good. Certainly good enough to hoof it around the Pandoran wastelands and get some XP with our friends. Obviously, we'd like to hear what you think about the experience so far. Since we don't have access to every version of the game, we're relying on you to help your fellow Kotakuites with information about the online portions of the Xbox 360 and PlayStation 3 versions.